My throat’s decided to spaz on me again, and I’ve been coughing pretty much nonstop for the last couple of hours despite cough syrup, cough drops, and hot lemon with honey. Bleh. Perhaps tomorrow I’ll stop by the druggist for some Buckley’s, possibly some of them fancy lotion tissues, and a magazine or sumthin’. So here I was, thinking that tomorrow afternoon during my four-hour break (annoying, and I can’t work then anymore because then I’d always be 15 minutes late for my 6 o’clock class now that it’s farther away on campus) I’d set up in the JCR (Junior Common Room) of my college building and knit for awhile. But no, I should go down to Queen street and look for buttons for my Must Have! I’m most close to finishing this last piece – I’ve got about an inch or two on 20 stitches to go. So when I seam it up this weekend, I want to have the buttons ready and waiting to be put on. I’m worried about the pilling, though. Classic Merino is pretty notorious for it, and I saw for myself when I saw the state that the grey-and-cream scarf I gave a friend for Christmas was in today. Sigh. Oh well, there’s not much I can do about it now. 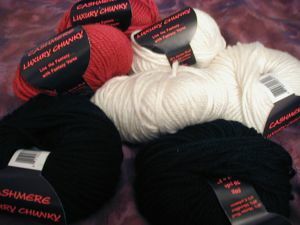 It’s 7 70 yard skeins of “Cashmere Luxury Chunky”, from A.C. Moore in the states. It feels really, really nice. 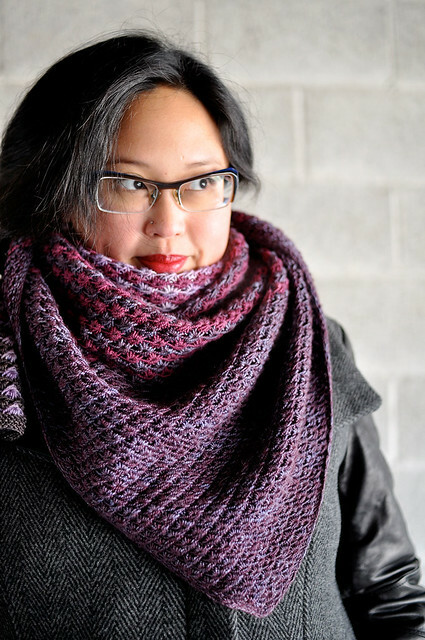 I mean, the default is one or several quick-and-dirty scarves, but are there any other suggestions?